From the world-class neurology and cardiology departments to the largest pediatric cancer and blood disease center in the United States, Texas Children’s Hospital offers complex treatments in some of the nation’s finest specialty and subspecialty divisions and centers of excellence. Working closely with its academic partner, Baylor College of Medicine, Texas Children’s Hospital was awarded a place on the 2018–2019 Honor Roll of best pediatric institutions by U.S. News & World Report. In fact, Texas Children’s was the only hospital in Texas awarded this distinction. 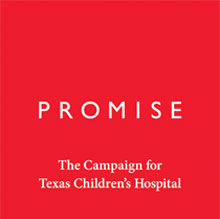 Texas Children's Hospital is committed to continuously enhancing our programs and centers of excellence, the Jan and Dan Duncan Neurological Research Institute (NRI) and the Trauma and Grief (TAG) Center are just two of the many areas that benefited from generous support during Promise: The Campaign for Texas Children's Hospital. The NRI was created to advance and accelerate our understanding of pediatric neurological disorders and to translate the scientific discoveries into better and more effective therapies. The primary purpose of the TAG Center is to raise the standard of care and increase access to best-practice care among traumatized and bereaved children, adolescents, and their families.